Over the past few weeks Nigel Farage has regularly described Douglas Carswell’s defection and resignation as “the most selfless political act” he had ever seen. But even acts of selflessness can come with benefits, today Breitbart London reviews the game changing benefits the Clacton win will give UKIP. It is hardly the world’s biggest political secret that UKIP are reliant on taxpayer funded European Parliamentary staff for most of what they do. The election of Douglas Carswell will add to these ranks with an additional budget for staff at the House of Commons. The Independent Parliamentary Standards Authority, which is the oddly-named expenses office, insists that all staff sign standard contracts. This means that Carswell can appoint staff at various different levels from Junior Secretaries on £16,000 a year to Senior Parliamentary Assistants who can make up to £45,000. He may choose to keep his old staff, assuming they have not already resigned, or take on new ones. Parliamentary staff tend to be graduates in their 20s. Almost all MPs work from two locations, their House of Commons office and their constituency. For the purposes of this calculation we have assumed the commercial cost of a plush House of Commons office would be around £50,000 a year. 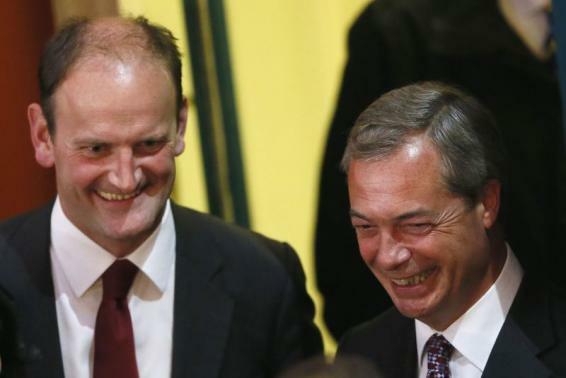 In addition, Carswell will be entitled to up to £23,250 to finance an office in Clacton. This can be used on rent and any other associated costs like buying desks. He will also be entitled to four computers and two printers. It is likely that he will continue to use the ones he had already been allocated before he resigned. As British government has become more sophisticated it has proved harder and harder for political parties to keep up with the resources given to government ministers. In order to redress this balance political parties are given what is called Short Money. The money is open to any political party that has either two MPs or one MP plus over 150,000 voters at the last election. Eligible parties get £14,015 for every seat won at the last election plus £27.99 for every 200 votes gained. This would give UKIP a whopping £142,685. It is unclear whether any payment would be made with less than one year to go before the election but even if the money does not come before May 2015, the party would still expect a large pay out after. With an MP in the House of Commons UKIP have opened up a whole world of opportunities that were not open to them. In this Parliament the Green Party were given the right to appoint one new member of the House of Lords. Sooner or later UKIP will be asked to do the same thing. The party now has the ability to pick the date of the Rochester and Strood by-election. According to convention this is moved by the party that previously held the seat, but UKIP could break this rule. All it takes to move the writ is one MP. Perhaps the most valuable of all is the ability of Carswell to move amendments, propose legislation and speak on important issues. This will force existing MPs to listen and respond to UKIP. It also gives UKIP the ability to show the country which way it would vote on a variety of issues. This will be an amazing time for both Carswell and UKIP’s leadership.